You wouldn’t believe what we heard in Milwaukee from the anti-gun crowd. These are just some of the many lies and outlandish comments we heard when we were in Milwaukee a few days ago. Their Bloomberg-style manipulation of the truth will never end, and it was on full display at their protest. That’s why we have to keep pushing back, keep mobilizing gun owners, and keep expanding our presence across the state. We’ll tell you how in just a moment. First, no matter what the firearms issue is, you can be sure that Michael Bloomberg and his cronies are going to be opposed to it. Never mind that gangs in Milwaukee are full of actual killers and murderers. But that doesn’t matter to the Bloombergs of the world. The anti-gun crowd doesn’t let facts or reason get in the way of a good lie. That’s why, when we learned of their plan to protest against the 2nd Amendment, we wanted to go down and cover their event ourselves. We wanted to show them that there is a group on the ground in Wisconsin who is going to stand up to their Bloomberg style tactics and lies. When we arrived, we heard lies being spewed from their speakers’ mouths that would make your skin crawl. For one, they attempted to explain the “gun violence” problem that currently plagues the city of Milwaukee. Did they blame the gangs that are spilling over from Chicago? Did they even blame gang on gang violence at all? That’s right. According to Wisconsin Anti-Violence Effort, it’s your fault that gun violence is increasing in Milwaukee. If blaming innocent people seems like a common theme, you may remember the Milwaukee Police Chief’s comments several weeks ago. He said that law-abiding gun owners having the ability to defend their lives was a major factor for the increasing gun violence epidemic in Milwaukee. There must be something in Milwaukee’s water that makes anti-gunners think that innocent people are the bad guys, and gang banging thugs are the good guys. And sadly, this type of nonsense was on full display in Milwaukee. 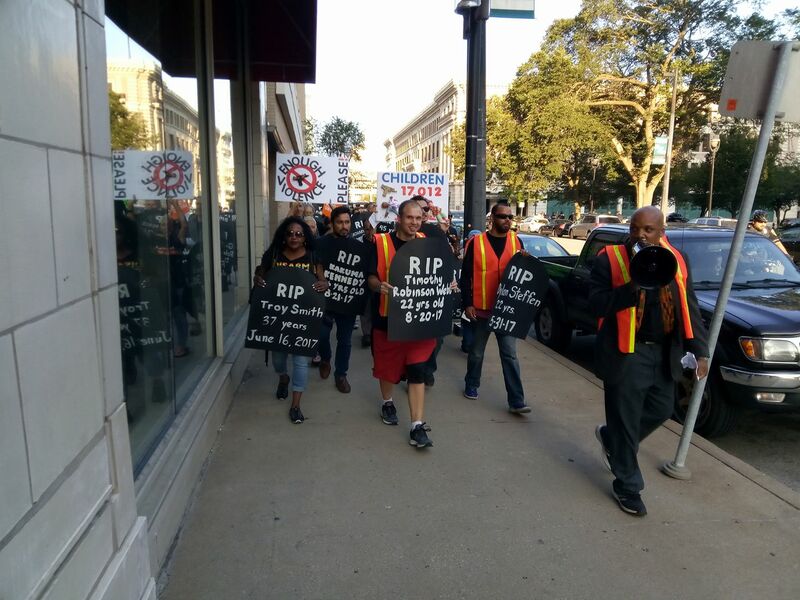 After several speeches from anti-gun “community leaders” and chanting from the crowd, the protesters took off on a march to degrade gun owners. 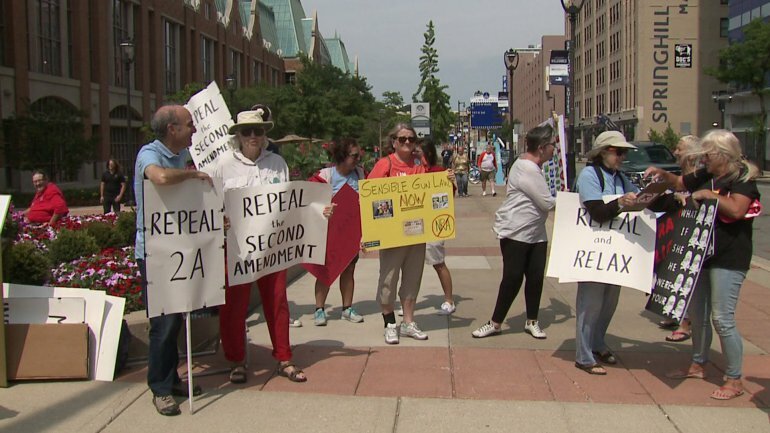 When we confronted these anti-gun zealots about what their real purpose was in protesting your gun rights, they tried to claim that they support the 2nd Amendment but they just want “common sense” gun laws. What they aren’t telling you is the truth. As most of you already know, “common sense” gun laws are merely a term for anti-2nd Amendment laws. Laws that we will be required to follow and the criminals will ignore. What they aren’t telling you is that their real goal is the abolishment of the 2nd Amendment. We even have a picture of some of the protesters who were bold enough to finally put it on a sign! While groups like Wisconsin Anti-Violence Effort continue to lie about what they really want when it comes to guns, we know the truth. They will not stop until the 2nd Amendment is abolished and every gun is confiscated. Remember, it wasn’t long ago that anti-gun politicians were controlling the Senate in the Wisconsin legislature. We are in a state where one election cycle could flip a pro-gun majority into an anti-gun majority. What can you do to help us grow and mobilize more gun owners? >>> First, give the anti-gun zealots in Madison and Milwaukee a political slap in the face by joining the Wisconsin Firearms Coalition today! >>> Then, make sure you are following us on Facebook. Often during the session when things are moving at a rapid pace, Facebook is the quickest way to receive important updates. >>> Finally, if you get a chance, check out our video from Facebook where we recorded some of the absurd signs, and chanting that the anti-gun crowd was screaming at us. One of the anti-gun zealots even confronted me on camera! We appreciate your hard work and all of your support. It’s time for all of us to stand up and tell these Bloomberg cronies we have had enough. P.S. Michael Bloomberg’s cronies were on full display in Milwaukee last week and the Wisconsin Firearms Coalition was on the scene to cover their rhetoric and lies. We exposed their lies and distortions at their protest. But never underestimate them. They are “hell-bent” on destroying your 2nd Amendment rights. That’s why we need you to stand with us right now. Please considering joining the Wisconsin Firearms Coalition today and standing with us against the Bloomberg elite in Wisconsin who are fighting hard to take away your gun rights!